The world population now has passed the 7 billion mark. Although food production in modern times has generally surpassed demand, the margin of safety is very small. The latest numbers for 2011 show that cereal production (2,344 million tonnes) exceeded demand (2,325 million tonnes) by less than one percent. Despite this surplus, one billion people are suffering from malnutrition while at the opposite extreme, one billion are afflicted with obesity. Although the chief fault lies with distribution which is not equitable, food production yield in its current form is itself approaching the tail-end of the proverbial S-curve. The world's longest-running research on wheat yield has been conducted since 1843 at Broadbalk field, which lies within Rothamsted Research, an agricultural research station in the UK. 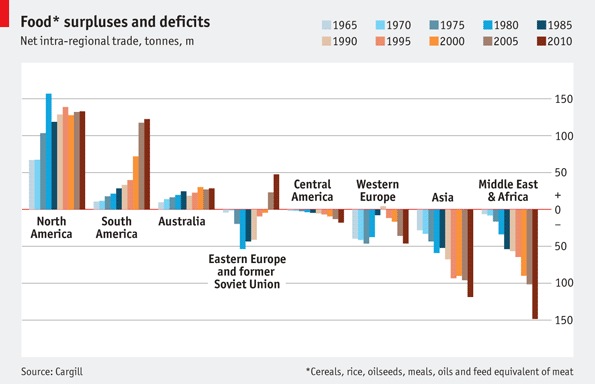 Its record of wheat yields (see chart at left from The Economist) is instructive. After the discovery of guano in the 1830s followed by Chilean nitrate in the 1870s, progress in wheat yield as well as those of other cereal crops since then had been static for more than 100 years. During this period, increasing the food production depended on the opening up of new lands, which were in abundance, for cultivation. Since the advent of the Industrial Revolution, new farmlands have been created in the American Midwest, followed by the Canadian prairies, Ukraine, Australia and New Zealand. Consequently, the growth in food production before the Green Revolution of the 1960s was derived not from higher yield but from increased acreage. This explains why Hitler wanted to expand east lest Germany ran out of space for food production. There was technological progress then but its main impact lay not in increasing yield but productivity through the replacement of farm labour and animals with machinery. Mechanisation started with the use of animal power, specifically, the horse. The early animal-powered machine began with the reaper (1830s), then the reaper-binder (1870s) and when it finally included threshing technology, it became known as the combine harvester (1880s). When the steam engine came along, it didn't totally replace the horse because the heavy weight of the machinery made it unwieldy on the farm. As a result the steam engine was generally operated from a fixed position. In Britain because of the soft ground, the steam-powered machinery was stationary and a cable was used to pull ploughing or cultivating implements across the field. In this case, two steam engines located on the opposite ends of the field and attached with a winch each would pull the implements first in one direction, and then the other. However in the US, the fields being of hard ground, the steam tractor itself would haul the plough. The steam tractor also pulled steam powered combine harvester but its productivity improvement over the horse powered was only one third. However the benefits of replacing horses were realised not only in the form of greater workload capacity but also in the increased availability of land, about 25% more; this being the result of land formerly used to grow animal feed now switched to human food. The introduction of the lightweight gasoline-powered tractors in the 1910s offering vastly greater productivity eventually totally replaced both steam engines and draught animals. 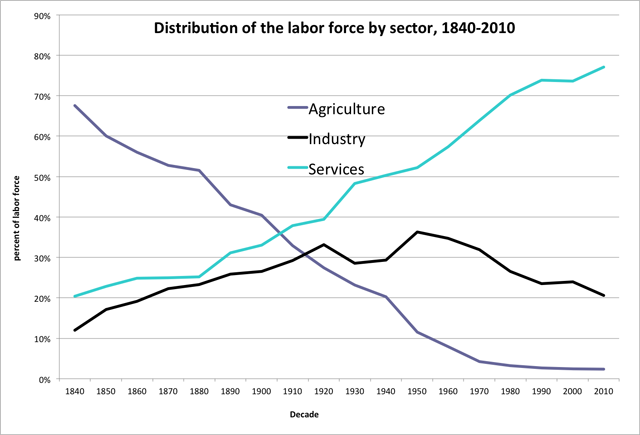 Such mechanical innovations which have largely run its course are the root cause of the decline in US agricultural employment since the 1840s (see chart below from the MinnPost). The Green Revolution which started in the 1960s contributed only a minor portion to the decline. Similar employment busting trends which have afflicted manufacturing since the 1950s are now plaguing the services sector, read the government sector since it is turning out to be the biggest employer in this depression if you also include the private sector employment that depends on the expanding largesse of government deficits. In time this will leave the government prostrate which should see to the decline of the services sector jobs. The increased production from the new fields would have amounted to nothing had not advances in communication, food storage, and food processing technology progressed alongside to ensure that the surplus production was transported and distributed to those able and willing to consume it. However, it was the communication aspect that played the most prominent role in ensuring the uptake of US grain by other countries. As usual, major changes in communication can be segmented into periods that correspond with the Kondratieff Waves timeline. The First Kondratieff Wave was set in motion in Britain, the cradle of the Industrial Revolution. But it didn't take long for the US to latch onto the Kondratieff Wave bandwagon. By the Second Kondratieff Wave, the US would overtake Britain in all aspects of the 4Cs. Grain grown in the Midwest had to be transported through the Erie Canal—which had been completed in 1825—to New York before being shipped to Europe. Even though rail technology already existed, it was used only for short distant travel because the wrought iron used could not bear the high pressure of the steam boilers nor the weight of the railcars. Only when steel was introduced, could the railways effectively end the commercial use of the Erie Canal sometime in the 1880s. Long before the canal construction, the grain producing centres had moved from New York and Pennsylvania to the two Dakotas and Minnesota in the Midwest. Without the canal, transporting the grain would require going through the Mississippi and loading it onto ships at New Orleans. From here, the grain would be sent to the east and Europe. The freight transport aboard the Europe-bound ships also benefited from the steel high pressure compound engines which saved 50% of the coal fuel compared to the iron single cylinder engines. It made a lot of difference as coal used to occupy two thirds of cargo space. By the Third Kondratieff Wave, ships were using fuel oil allowing them to travel farther without refueling while releasing more space for cargo. Steel has also gone into ship construction. Steel ships are 15% lighter than iron ships, and both do not have the structural limitations of wood which restricts the length of a ship to 300 feet. It thus beggars belief the claims in historical texts that Zheng He's 15th century wooden ships reached 400 feet as the keels of such ships wouldn't have survived the longitudinal stress exerted by the high seas. Lack of proper transhipment, storage and packing facilities has often resulted in the spoilage of perishable goods. To address this, the steam-powered grain elevator was conceived in the 1840s to mechanise the loading and unloading of grain. For the transport and packaging of meat produce, canning enabled Australia to ship vast quantities of meat to Britain from the 1860s while mechanised refrigerated shipping, introduced in the mid 1870s, did the same for beef and mutton shipped from Australia, Argentina and the US to Britain. Containerisation which was introduced just before the Fourth Kondratieff Wave helped the US army sort out its logistics mess in the Vietnam war. By packing cargo in standardised boxes, containerisation facilitates the loading and unloading of non-bulk cargo, and its seamless transfers between ships, trucks and trains, very much like the internet formatting and routing data in packets. It has fueled the rise of global trade, the benefits accruing mostly one way from the inefficient and prodigal to the efficient and frugal. The dramatic increase in cereal yields started to register only from the 1960s although inorganic fertilisers had been available decades earlier proving that it wasn't solely the fertilisers that led to the higher yields. And the increased yields were also recorded for fields fertilised by organic manure (see first chart above). The key to increasing the yields in fact had been found in the Scientific Agricultural Revolution that preceded the Industrial Revolution but it was carried out on livestock, not crops. Only in the 1960s, was cross breeding of plants being carried out to take advantage of the nutrients furnished by the fertilisers. The person most responsible for championing this cause was Norman Borlaug. With the artificial synthesis of nitrogen which was invented in 1911 by Fritz Haber, there has been no shortage of inorganic nitrogen-based fertilisers. However before the 1960s, farmers had to restrict fertiliser usage as larger and heavier seed heads would result in the plants toppling over. What Borlaug did with his cross breeding was to produce dwarf wheat breed with shorter stalks that could support the heavy weight of the seed heads. Mass starvation in India was averted with the help of this new breed. The heavy consumption of nitrogen fertiliser on the farms can be seen from the following graphic from The Economist comparing the situations before and after plant cross breeding took hold. The great transformation of agriculture in the 1960s onwards has conferred us an unprecedented steep increase in population (The Economist chart at left) but this population dividend is now turning into a drag as fertility rates are falling off the cliff. For this, we can thank urbanisation and improved healthcare and yet we'll see more worsening rates with the coming economic depression. Now you know why the great deficits of most nations after World War II could be easily whittled down. The reason can be traced to the global economic expansion on an unparalleled scale brought on by the tremendous increase in population. Simply put, the consumption rose to absorb what the capacity produced. It had never happened before and it will not happen again. The great availability of nitrogen-based fertilisers doesn't mean that yields would keep improving. Overuse of such fertilisers, as in India, has degraded the soil and lower the yields. India also has its share of other agricultural follies. Although it has recently reported record harvests, there are approximately 250 million Indians who are malnourished. The fault lies with distribution with the poor failing to get their ration coupons. Accentuating the problem is the lack of proper storage facilities, resulting in the high wastage of crops that have been left in the open. The right solution of course is to empower its populace with income generating jobs but that appears very remote as increasing automation and mechanisation have made the poor superfluous. Deaths from hunger have struck not only the urban but also the rural populace, bespeaking the futility of running way from the tightening grips of an economic depression. As for the world, did the spike in food commodity prices in 2008 (The Economist chart at left) signal the looming shortage of food? Or was it the diversion of corn crop towards biofuel that created the artificial shortage? Although producing bioethanol from corn is indeed a dumb idea to begin with, ascribing the blame of higher food prices to such practice is equally daft. Food commodity-prices slumped in 2009 in line with all commodities despite the fact that there had been no drastic reduction in corn used for biofuel. So the main cause for the spike and decline is money, or rather, credit creation and destruction, as explained in several of my earlier posts. However based on current agricultural technologies, we certainly have reasons to worry about food shortages. Looking at the first chart above, we know that yields have been static. And the recent issue of The Economist (see chart below) has demonstrated that the recent increase in food production was totally dependent on farming of formerly virgin land in the Amazon and adoption of western agricultural practices in former Eastern Europe Communist land. But these should be the least of our worries if we factor in the emergent technologies that will revolutionise agriculture and food production and distribution in the Fifth Kondratieff Wave. Among the radical innovations include genetically modified crops which since their first planting in 1996 have proven to have no ill effects. Since then the area planted with GM crops rose from 1.7 million hectares to 148 million in 2010. Even Craig Venter, who is in the forefront of developing designer bugs and new GM crops, believes that agriculture will undergo a radical change with commodity crops producing 10 to 100 times their current yields. Then we'll see the end of large scale farming as every person starts to grow his own food just enough for his own consumption, no more no less. The need to trade will disappear and with it the government's raison d'etre as food surpluses which were in ancient times the basis for financing the governing bureaucracy start melting away. We should be more worried about the declining rate in population growth than the constraint in crop production. The history of capitalism is replete with constraint breaking technological breakthroughs. In the future, for example, if agricultural yield could indeed increase more than tenfold, we could be using hydroponics to grow plants in high-rise buildings. Currently, the initial capital cost restricts the wider application of hydroponics. All the land cleared for farming now could then be returned to its forest state. We should now train ourselves to eat less. where is the information on the graphs from? specifically the distribution of labor force by sector? It's from the MinnPost. You can click on the link above.